Fill your Christmas stocking with Festive Cheers! ThirtyFifty wine tasting vouchers make fab Christmas pressies for wine loving friends & family and can be redeemed against our One Day Wine Experiences and our Evening Wine Experiences. Our Evening Wine Experience Wine Tastings are run regularly throughout the UK including in London, Bristol, Birmingham, Cardiff, Liverpool, Leeds, Leicester, Manchester, Sheffield and Norwich. All evening events include antipasti platters or canapés to accompany the wines and our London Supper Club, at £49 per person, includes a main course and cheese. Our One Day Wine Courses are held in London at Brasserie Blanc, Bristol at Browns Brasserie and in Cardiff at Le Monde — all in central, easy to get to locations and provide a great quality three course lunch with matching wines. Getting away from the city, in countryside locations we also host the day courses in Cheshire and Buckinghamshire. Our Weekend Wine Tasting Breaks make a great weekend away for two or with a few friends. For 2019 we have two locations in Buckinghamshire and Cheshire offering everything you need for a relaxing wine tasting break. One night's accommodation, meals and our One Day Wine Course on the Saturday - all for £159 per person. Open-dated Vouchers are available or you can book a specific date with us. If you don't know the exact date and location that you want to book, our open dated vouchers are ideal and very popular as Christmas gifts. They give the recipient 2 years to book the evening or day they want to go on by contacting us when ready to book. Our One Day Wine Course and Discovery Day Vouchers are £89 per person (with 16 wines and a 3 course lunch) and our Champagne & Sparkling Tasting & Lunch is £89 per person (10 champagnes & sparkling wines and a 3 course lunch). A wonderful day out! The Wine Tasting Evening Vouchers are £39 per person for a 2 hour tasting session with antipasti or canapés. We also have Champagne & Sparkling Wine Evenings in London at £39 per person and a Friday Wine Tasting Supper Club in London at £49 per person. These make a special evening out, sharing good wine and good company! The vouchers are open-dated and are valid for 24 months and can be emailed free of charge or we can post a printed voucher presented in a smart purple envelope for an additional charge of £2, allow 2-4 days for delivery. Order online or call us on 020 8288 0314 and we'll be happy to help! The last date for posting vouchers is Saturday 22nd December 2018. 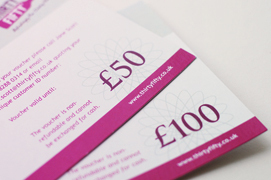 Email gift vouchers are emailed automatically as soon as you have completed your purchase. Not sure which of our wine tastings to choose as a Christmas gift, or want to treat your family to a wine tasting at home, why not purchase our £50 or £100 Gift Vouchers. The vouchers can be used towards any of our wine tastings or to purchase wine from our online shop, as full or part-payment and are valid for 24 months. Our wine tastings at home are priced from £30 per person with a minimum of 10 people. Once in receipt of the vouchers all that's needed is to contact us to set a date. Vouchers are emailed automatically once you have completed your purchase or for an additional £2 we can send a printed voucher by post. Please allow 2-4 days for delivery.